Everyone has their own approach on shopping for the holidays, but we all know the stores can be cramped and a bit crazy at times. There is often a rush of people running around trying to purchase their presents, sometimes getting a bit intense in the process. For some people the holiday shopping rush isn’t so bad, for others it can be a bit miserable. 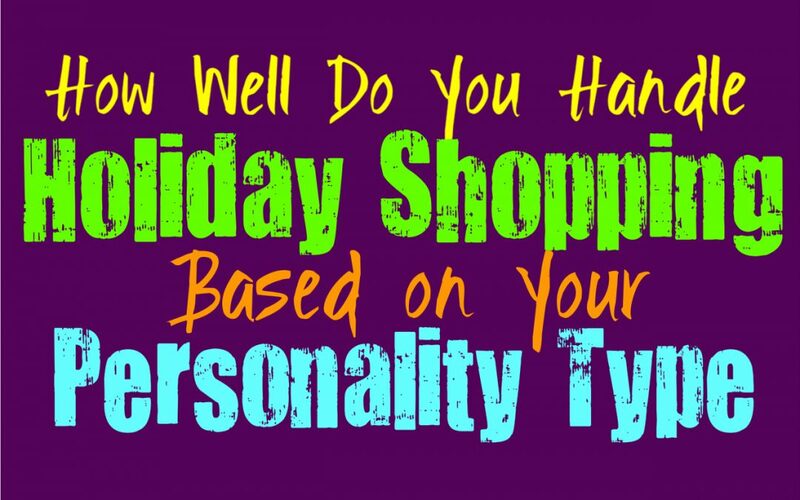 Here is how you handle your holiday shopping, based on your personality type. For INFJs even the thought of holiday shopping can be a bit draining and in some ways feel a bit shallow. They might feel like people become far too wrapped up in purchasing gifts and receiving them, rather than actually being around their loved ones. The draw to consumerism during the holidays can be a bit too much for the INFJ. At the same time they do often think a lot about what they want to get for the people close to them, which is just another thing that plays into their contradictory personalities. INFJs enjoy making people happy and want to do what they can to make their loved ones feel special. For them the best way to do their holiday shopping is online, since having to do this in stores can be extremely draining. ENFJs often handle holiday shopping with a sense of control and even poise. They are rather organized people who know how to keep things together in order to get the job done. ENFJs will often plan ahead and even start their holiday shopping earlier than most people. They want to be able to please everyone and make sure their loved ones feel appreciated during the holiday season. The crowds and rush usually don’t bother the ENFJ that much, and they can navigate it rather well. They simply come up with a game plan in their minds and do their best to work towards that. INFPs can become sincerely overwhelmed by holiday shopping and especially the more crowded days like Black Friday. For the INFP this feels extremely draining and even a bit shallow, mostly the way people obsess over shopping and getting the best deals. It can feel like everyone is missing the point of the holidays and not really spending time with their family like they should be. For the INFP it is important to focus more on connections rather than trying to ruin the holidays by obsessing over who gets the best gift. For them holiday shopping isn’t an enjoyable experience, and so they often try to get things that are more personal and meaningful. ENFPs don’t often mind holiday shopping all that much, and might not even become drained by the more crowded days like Black Friday. For them it might be exciting to see everyone rushing around to get their gifts and snag deals. ENFPs might even enjoy the competitive nature of the experience, at least for a short amount of time. For them it is more about the thrill and seeing what is going on in the world around them. For the most part ENFPs might prefer to do their shopping online or simply get gifts during slower times. INTJs don’t usually enjoy holiday shopping all that much, since they aren’t usually focused on gifts and having to exchange them. For the INTJ having to go out into the rushing crowds is both exhausting and completely pointless. They often prefer to do their shopping online or during times when there are less people fighting each other for sales and deals. The whole experience often appears shallow and a bit embarrassing for most INTJs. They aren’t usually the best holiday shoppers and will often prefer to get it over with, without having to encounter other people. ENTJs might be extroverts but for them the rush of holiday shopping and the crowds, can actually be a bit exhausting. They don’t like dealing with people who are all over the place and often extremely rude to those around them. Having to stress about snagging the best deals, can actually be more draining than it is worth for the ENTJ. They don’t mind picking out nice gifts for their loved ones, since they can be surprisingly thoughtful people. For them it is more about trying to avoid the crowds and find ways to do their shopping without dealing with people all that much. INTPs don’t mind holiday shopping, but sometimes it can be a little bit stressful for them. They want to make their loved ones happy but sometimes it can put a lot of pressure on them to pick the right fits. The best thing for the INTP to do during the holiday season, is simply pick gifts that feel sincere and personal, rather than trying to overthink it. They need to avoid the stress and shallowness which can be involved with holiday shopping, in order for them to actually enjoy picking out gifts for their loved ones. For the INTP it can be a bit draining to see how people behave, but they can often get over this. ENTPs might enjoy the hustle and crowds of the holiday shopping season, since it can feel a bit like an extreme sport. They might even want to go out and venture the crowds on Black Friday, just to see how people behave and maybe even make a bit of a competition out of it. ENTPs just like observing people and diving into something a bit different, since they really aren’t fans of stagnancy. Sometimes the rush and craziness can shake things up for a bit, but eventually they will want to get away from the people and might even prefer to do their holiday shopping online. ISTJs are often very organized about their holiday shopping, and might even venture out on the busier times of year. While they don’t enjoy being around the crowds and pushy people, ISTJs are often very frugal. They might enjoy Black Friday sales and the opportunity to purchase items for great deals. They will often plan ahead and know which items they want, so that they can get in and get out without too much stress. For the most might they might prefer doing a large portion of their shopping online, so they can avoid dealing with too many people. ESTJs are very frugal people and because of this they might not mind venturing out to do their holiday shopping on the massive sales days. As long as they are likely to get good deals so that they can save some extra money, the ESTJ will want to take advantage of this. They are organized people who often have a game plan for which items they want to and how they can go about getting them. They can also be rather competitive and aren’t afraid to rush after the things they need and want for their holiday shopping trips. ISFJs really enjoy shopping for their loved ones and finding them the best gifts possible. They want to do their best to remain organized and often have lists set out of what they need and where they can get them. ISFJs might even be brave enough to venture out on Black Friday, especially if it will help them save money to spoil their loved ones even more. They care about making others happy and are very drawn to traditions. For the ISFJ shopping for the holidays is often very important for them, and is something they take seriously. ESFJs are very focused on traditions and often enjoy doing holiday shopping for their loved ones. They aren’t afraid to brave the busier times of year, as long as it will help them get the items they want. ESFJs simply enjoy being able to make their loved ones happy and for them it is important that they feel appreciated. They will do whatever they need to in order to make the holidays truly special for everyone around them. While ESFJs might become a bit stressed being around the large crowds of rude people, they will handle it in order to make the holidays great for everyone else. ISTPs can become a bit exhausted with the whole idea of holiday shopping, especially when it comes to large crowds. They don’t like having to battle with other people to snag certain items and will likely become bored of this rather quickly. ISTPs do enjoy making their loved ones happy, and they might even be good at finding the right gifts. For them it is nice to be able to see the item in person before purchasing, but they might utilize the benefits of online shopping simply to save their own sanity. ESTPs are often great at holiday shopping and enjoy being able to get the perfect gifts for their loved ones. They don’t mind braving the crowds and might even enjoy the excitement of it all. ESTPs simply don’t enjoy stagnancy and so there is something a bit thrilling about the intensity and craziness of the holiday shopping season, especially days like Black Friday. While they might do a lot of shopping online as well, ESTPs just like being able to switch things up a bit. ISFPs often enjoy holiday shopping and being able to pick out fun and exciting gifts for their loved ones. ISFPs can often think of the most creative presents, ones which are personal and sweet. For them the craziness of holiday shopping isn’t so bad, but they might prefer to pick out their presents at quieter times. They do become overwhelmed with too much social interaction and so being around tons of people can be a bit draining for them after a while. ESFPs are often amazing at holiday shopping and so they enjoy being able to pick out the best gifts. They might even make for great personal shoppers, simply because they are good at finding the right items for a good price. ESFPs can be somewhat lavish people, who enjoy going over the top for those around them. They don’t mind the crowds and craziness and might even become excited by the whole experience. For the ESFP holiday shopping is often a breeze, since they have mastered the experience.